In our current culture of frugality, cost-cutting measures rule. During these tough economic times, there appears to be a universal guiding principle embraced by individuals and businesses alike as they wonder what could possibly be more important than low price. How about quality, workmanship, design, and service? "There is hardly anything in the world that some man cannot make a little worse and sell a little cheaper," John Ruskin famously observed. This is true for many things, some may argue, but with a stone countertop, what could go wrong? The answer to that question, unfortunately, is "plenty." Below is a list of common, cost-cutting measures used by "low-price leaders" in the stone fabrication industry, as well as some of the unfortunate consequences they reap. Cost cutting tactic #1. Use the least amount of material. This leads to many undesirable results, such as incorporating more seams, or having seams where there should not be any. In addition, in order to utilize every inch of material when laying out the pieces, this method ensures no regard for color or grain matching, and no attempt to avoid blemishes, or unattractive parts of the slab. 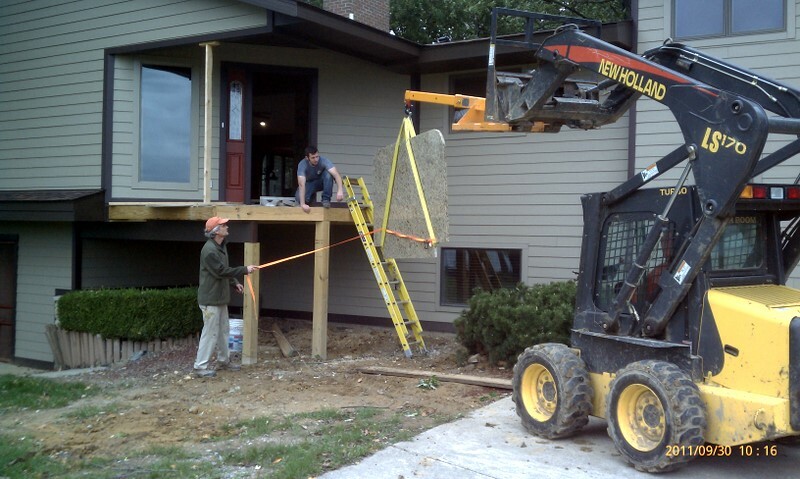 Changing directions on the slab can save a lot of material! Cost cutting tactic #2. Use the cheapest stone from the cheapest suppliers. 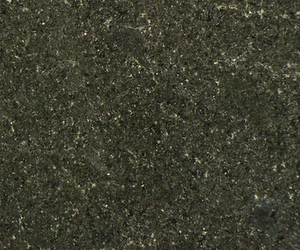 Low quality granite is undesirable in many ways. It is often very porous, or has excessive fissures, cracks and pits. Frequently it is thin--2cm instead of 3cm. ; in addition, there is usually a very minimal color selection. "Hundreds of slabs to choose from..."
Cost cutting tactic #3. Cut the process time. Beautiful details take time and, as we all know, time is money. It is much less expensive to eliminate every curve, every angle, every fade-away, every under-polish, and any bit of attention to every "character-enhancing" step. Also very time consuming, is a proper polish, but a good one lasts forever. 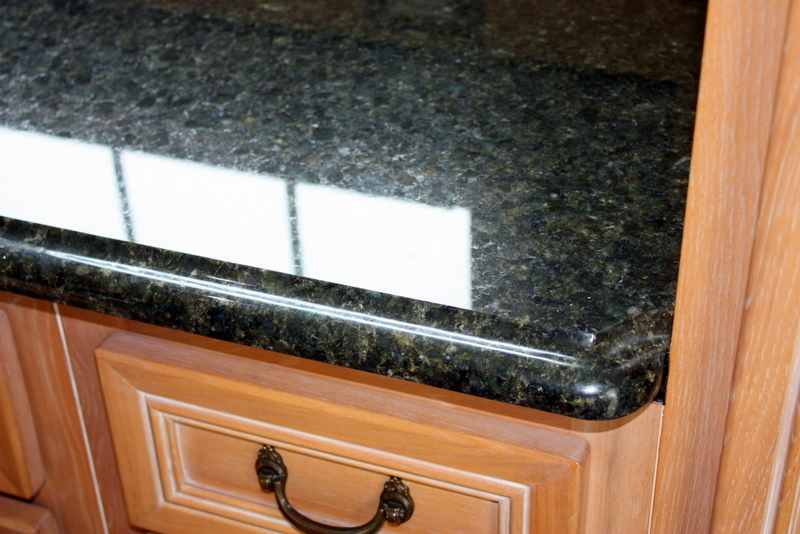 One method sometimes used to lower costs is to give the granite its polish by quickly applying a wax, which looks good initially, but wears off over time, exposing the dull surface underneath. This polish will last a lifetime. A popular cost-effective practice is to outsource as much work as possible. (Often, even companies who claim that their installers are employees are actually using contractors for the installations) The job is split between one person who measures the job, another who cuts the granite, and a final team who installs it. There's little communication between teams. Contracting to the lowest bidder is likely to result in poor communication, frequent mistakes, disappointments, and ultimately a less attractive finished product. A complicated and potentially impossible installation saved by good communication & preparedness. If you decide to choose a reputable fabrication company--"even if you have to pay slightly more for your natural stone countertop--what will you be getting for your investment? A unique and beautiful stone that you had the opportunity to examine and hand select (with the help of your fabricator) that has fewer pits, fissures, or "birthmarks." A well-thought-out design that flows with the rest of your home. Custom details that are esthetically pleasing. 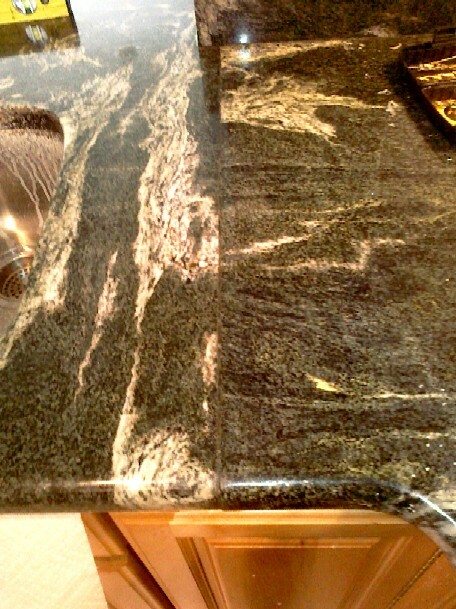 A good quality sealer that protects the stone's beauty and lasts longer. Patient and professional assistance throughout the process. The promise of conscientious and motivated craftsmen and designers who take pride in their work and want to keep you happy far into the future.